There are dozens of little seedlings thriving under the grow lights. Pepper, eggplant, and tomato plants are just a few inches tall here at the Hobson Estate. Outside, the weather is swinging from cold to cool. 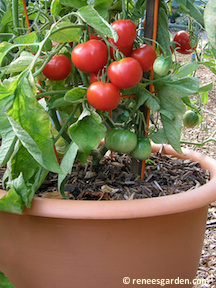 It should be at least a month before I plant tomatoes outdoors in containers or in the garden. I’ve done something that I would never recommend that you do. Because I started tomatoes from seed, there are more future tomato plants under the grow-lights than the garden can hold. I planted two tomato plants outside. No kidding. One on April 6 and one on April 8. I planted them deep. Deep being relative when it is a plant only 5 inches tall. I put a quart canning jar over the tomato plant. Perhaps this will work as a mini greenhouse. It will protect the tomato starter plant from colder night-time temps. It looks like I have planted canning jars in the garden. If only I could talk those tomatoes into canning themselves, I think I could get a book deal or, at least, a pretty good spot on the TV shopping channel. Stupice tomatoes are a small, early producer of red two-inch fruits. Dwarf indeterminate; in the garden it may grow to as much as 5′, in containers the plant will be shorter. Staking is optional. From the former Czechoslovakia, these compact plants have potato leaf foliage. They are loaded with clusters of 2” fruits. Expect tomatoes 60 days from transplant. Or, in my case, I hope, less than 60 days after the soil as warmed. University of Missouri Extension recommends A family interested in having only fresh fruit should plant three to five plants per person. If enough fruit is wanted for processing, then five to 10 plants per person should be planted. To get best results with only a few plants and minimal trouble, purchase plants from a local greenhouse or nursery at the proper planting time. When is the soil warm enough? Soil is at least 60 degrees in the daytime and at least 50 degrees at night. Tomato plants will not grow until the weather gets warm. If this little tomato lives, it will be a delightful surprise. Gardeners are always full of surprises. This little Stupice tomato plant is in a large container, in full sun, Zone 6, SE Missouri. I bought these seed from Renee’s Garden. They were planted under the grow light March 13, 2013. 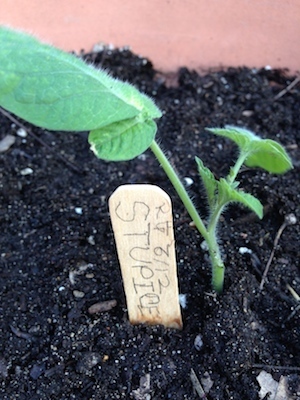 It was transplanted into the garden container April 6, and another Stupice tomato plant was planted April 8, 2014. If we have a freeze, the plants will curl up and die. That is OK, I have plenty more Stupice tomato plants inside thriving under the grow lights. I will plant them when I am supposed to, more than one month later an Mid to late May. five days later , the Stupice tomato plants are thriving and have outgrown their quart jar solariums. So it looks like we will have a week of windy days above 60°. So, I’ll forge ahead with planting the container tomatoes. Take advantage of the decent weather whenever you can. Garden at every opportunity, because you never know when the next beautiful day is coming. This summer may turn into a scorcher, getting so hot the tomato plants won’t set fruit. Or, for example, put off mowing one more day, tomorrow and the rest of the week it will be downpours. You will need to cut and bale the grass at your next opportunity. Wish me luck. I am planting tomatoes a month earlier than I ever have. Sunflowers! Becky, they remind me of you. Sunflowers make me happy. Here’s to sunny days! True, the sunflowers aren’t even planted yet. But they will be. I’ll be taking pictures of all of them when they bloom. I grow them for the birds (goldfinches) but the squirrels get their share. Some are pollen free, so they are not messy and make wonderful bouquets. They are top-heavy sunflowers, so they seem to like heavy glass pitchers or old crocks as flower vase. You’ve seen a lot of different sunflowers in my garden. I can never have too many sunflowers. Anyway, Becky, these sunflowers make people happy and I think that is one of the reasons they remind me of you. The birds and the squirrels get all the Snack Seed sunflowers. Sometimes, if I can get out there before that trashy little squirrel tears them up, I’ll cut a few seed heads to dry. In the winter, the birds flock to these seed treats. These mixed sunflowers are just like planting surprises. You never know exactly will come up, but you know you are going to like them no matter what. “Well, you are always welcome in my gardens,” I said. *Becky Funke is in a hospital that does not allow flowers in the rooms. So, not to be deterred, I’ll send them on Pinterest. You can stop by her CaringBridge site to leave well wishes and get updates. Her family keeps the site up to date. All of the sunflower seeds are from Renee’s Garden The sunflowers have beautiful photos and planting/care guides online at Renee’s Garden. On Facebook. These lovely flowers wave in the breeze scenting the pergola seating area with the heady scent to jasmine. When you come visit, we will sit under the pergola and enjoy all the scented white flowers. This garden area is designed as a night garden showcasing white flowers like white Bougainvillea and this Aztec Nicotiana. 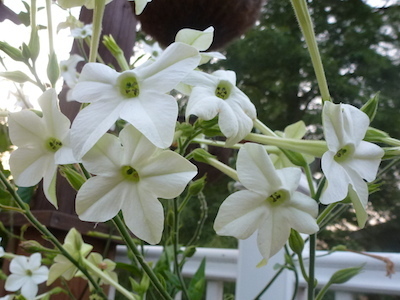 Aztec Nicotiana Photo by Patsy Bell Hobson. This is the first time that I grew Nicolina. The jasmine fragrance is light, never overbearing. It was the start of the containers, crowding out the shy flowers and taking center stage. 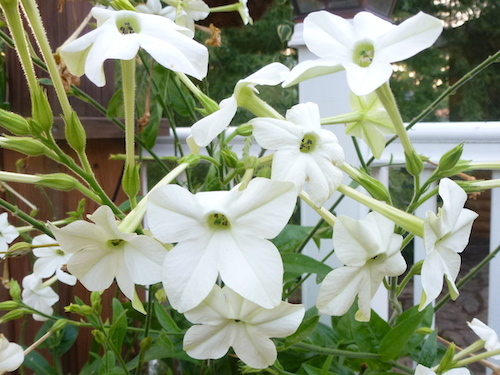 Aztec Nicotiana is so named because the Aztecs considered the plant sacred and medicinal. Hummingbirds, butterflies and bees love this plant. This flower is a good choice to plant near vegetable gardens because it attracts so many pollinators. It’s a shame that these flowers are so short-lived. There are plenty of them, blooming right through summer. Photo by Patsy Bell Hobson. Becky, I’m sending these flowers in a tall, clear cylindrical vase to accent the height and grace of this flower. *Becky Funke is in a hospital that does not allow flowers in the rooms. So, not to be deterred, I’ll send them on Pinterest. You can stop by her CaringBridge site to leave well wishes and get updates. Her 3 daughters, keep the site up to date. Posted in Becky's Flowers, Oh Grow Up! Blooms are pure white with a slender red ribbon edge. Photo by Patsy Bell Hobson. I’m sending Amaryllis to Becky. They are big, colorful and, not-to-be-ignored.The ones in my home are just thinking about blooming this December. The leaved are just peeking up about two inches tall. I am hoping for a Valentines day appearance. But these giant blooms are just for Becky. The beautiful white bloom towers over other Amaryllis, growing to as much a 3″. Photo by Patsy Bell Hobson. 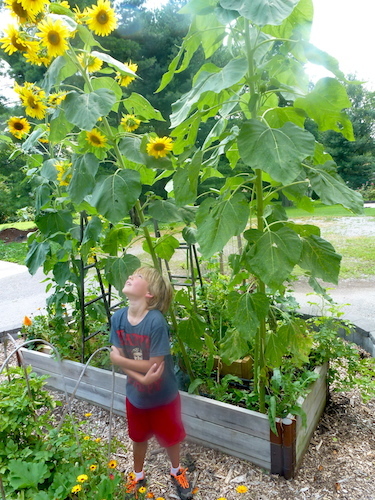 These big blooms top tall stalks, between 2 and 3 feet high. 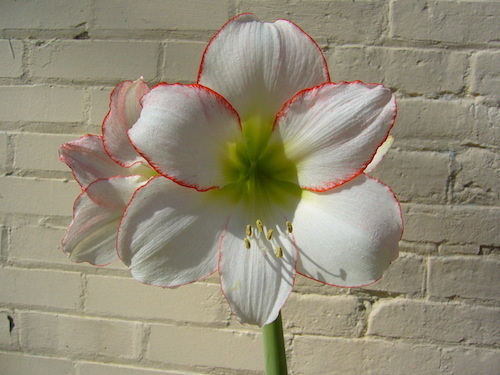 Amaryllis can become top-heavy when the flowers begin to bloom, staking is helpful. 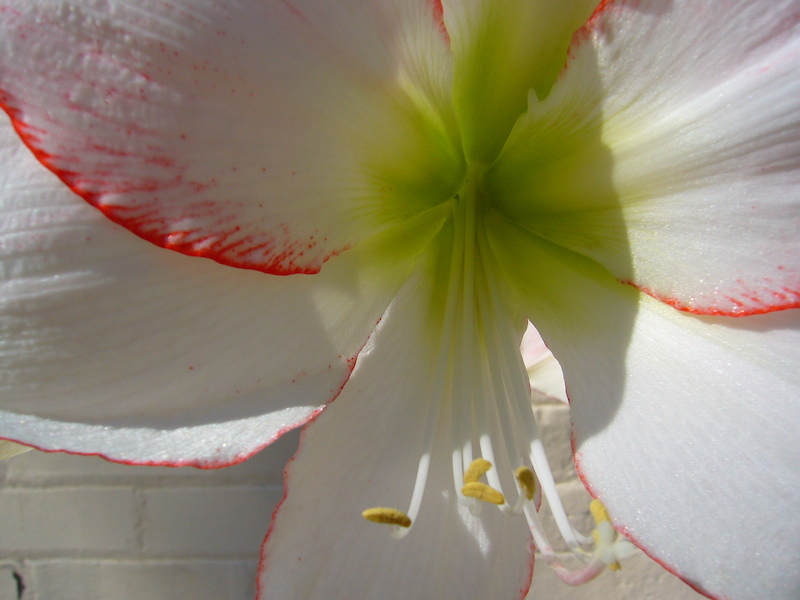 Amaryllis are most successful when planted in heavy pots just a bit larger than the bulb. The perfect spot for Amaryllis indoors is in bright light. Our zones 5 and 6 are too cold for growing Amaryllis as perennials. If this flower is meant to be an annual, simply keep the roots moist until finished flowering. Your Amaryllis does not need plant food. Blooms are pure white with a slender red ribbon edge. Bloom season: flowers in 40-60 days indoors and mid spring outdoors. Becky I’m sending the giant flower in a light plastic container. It will grow in this container, or you can “double pot”, setting the container inside a heavier, more decorative planter. *Becky Funke is in a hospital that does not allow flowers in the rooms. So, not to be deterred, I’ll send them on Pinterest. You can stop by her CaringBridge site to leave well wishes and get updates. The girls, her 3 beautiful daughters, keep the site up to date. Posted in Becky's Flowers, Gifts, Oh Grow Up! You can almost smell these quilted roses. Because your flowers aren’t just the every day florist’s bouquet, I’m sending you flowers that are quilted. 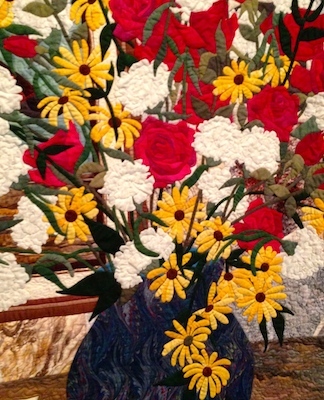 These flowered quilts are on exhibit at the National Quilt Museum in Paducah KY.
A giant mixed flower bouquet looks like a painting on the wall, not a quilt. Not all bouquets come in a vase. These are fiber art. Sometimes it takes just as long to quilt a bouquet as it does to grow one. Becky, wrap yourself in a blanket of flowers and friendship. My you find some warmth and comfort in your fablic bouquet. 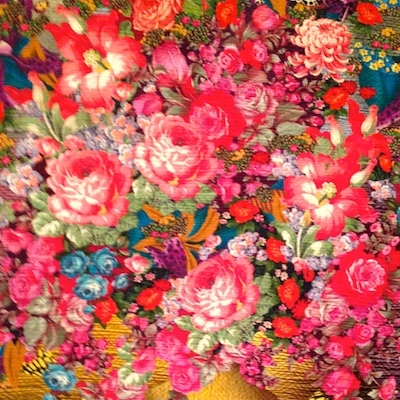 The detailed floral creations are a bloom with details. The National Quilt Museum is located in the heart of Historic Downtown Paducah; 215 Jefferson Street, Paducah, Kentucky 42001. For more travel information about Paducah, visit the Convention & Visitors Bureau. These little flowers are non stop bloomers. They can either be started from seed or plants. By mid summer, you can’t tell the difference. 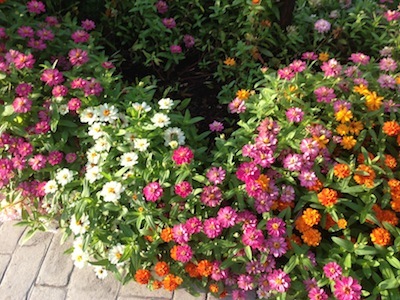 The seeded zinnias have caught up in size and vigor with the zinnias that were planted as starter plants. 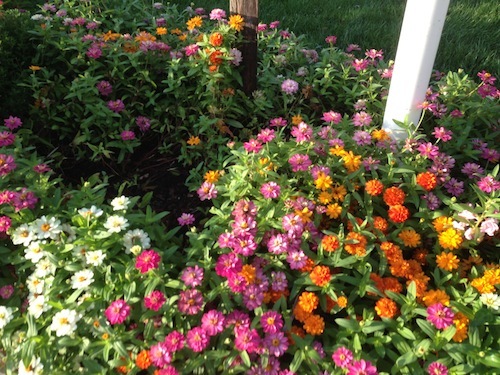 Profusion series of zinnia are an AAS winner (All American Selections) that tells you they will grow almost anywhere and everywhere, are very disease resistant and pest free.They are all in warm season colors some semi double and the newest ones are double. They are heat-loving plants, require little attention are good to grow in borders and in containers. The flowers are brightly colored, never fade and are a butterfly magnet. 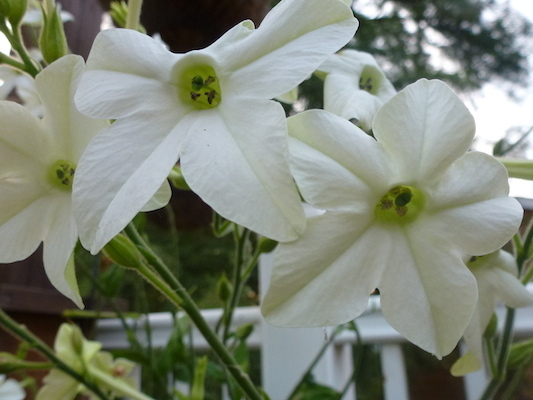 The plants get 18-24” tall and produce masses of 2″ semi-double flowers. Zinnias are a favorite cutting flower because they just keep on coming even if you cut a bouquet. Also, it’s easy to save seed and then, grow even more next year – because to can collect about a gazillion more seed than what comes in a seed packet. Becky I’m sending these flowers in three half-pint jelly jars tied with raffia bows. Keep the water fresh and refilled. (Zinnias are heavy drinkers.) Strip the foliage high enough to keep the leaves out of the water. They aren’t fragrant. But if you set the jars of zinnias out on the patio table, butterflies will appear. Magic! I have hundreds maybe thousands of the bright orange flowers. There was a good stand of them on the property when we moved into this Cape Girardeau house. Too bad these flowers don’t get frequent traveler points. Many of them are well traveled. They have taken many trips in my wheelbarrow. Because I have so many, they tend to get planted en masse. 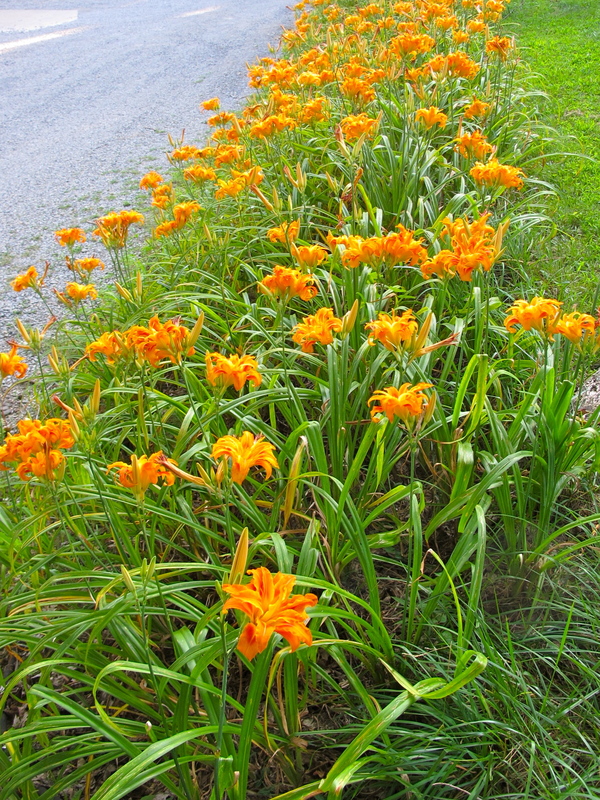 The daylilies are planted along a bank that is too steep to mow. I’ve never seen the triple blooms like these I’m sending you. Daylilies planted on a hillside that is too steep to mow. 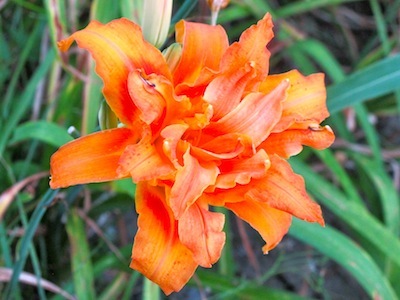 You often find daylilies naturalized in ditches of abandoned homes and farmland. Most often, we see the orange single blooms. There are lots of these “ditch” flowers in Kansas. They may be named daylilies because they only last a day. Each plant has several blooms. I’m sending you bunches that will last for days, maybe weeks. 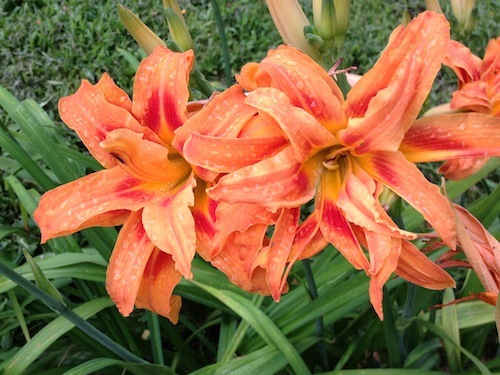 Becky, I’m sending you lots of bright orange daylilies. No fragrance, but great big bold orange flowers. I’m sending this bouquet of old fashioned flowers in a large, Fiesta ware peacock (Aqua) disk pitcher. Enjoy! St John’s Wort (hypericum perforatum) is a herb, sometimes it is considered a wild flower right up until the minute it is considered an invasive weed. The common name, St John’s Wort was given because it is usually in bloom during the summer solstice (dedicated to St. John). St. John’s wort, a plant that grows in the wild, has been used for centuries for health purposes. I grow this herb because the flowers are beautiful. I do not use it as a medicine. This plant cast it’s spell the minute I first saw it. Waving it’s petals in the warm, gentle breezes of late spring, I knew we were meant for each other. When I brought it home from the nursery, in a two gallon pot, it was covered with blooms. That was the last time it bloomed for the next 5 or six years. Since then, I’ve moved it many times, trying to find it a happy home where it can bloom and thrive. For some reason, it began to bloom again last year. And it has those big carefree gold blooms. It is lovely, butterflies and hummers like it too. Becky, this is the flower I’m sending to you today. St John’s Wort*. 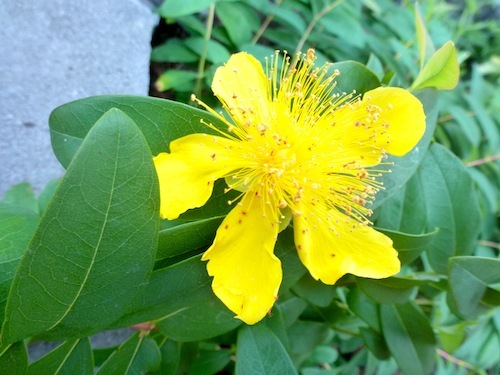 Imagine St. John’s Wort, golden as sunshine, with shrubby medium green leaves. If I could deliver this flower myself, it would come mounded in an old antique china tea pot. I love this bright bloom. It just makes me happy to be around it. I hope you like it too. It’s easy to dig up and divide, so just say the word and I’ll send you a division. St. John’s Wort is a shrub-like perennial herb and it can be invasive. So, be careful what you ask for. Some folks use this herb medicinally. 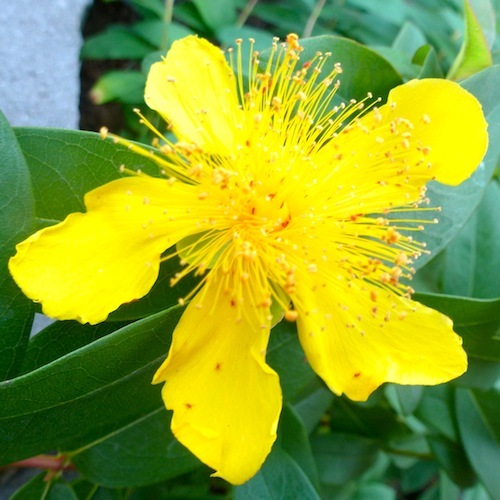 St. John’s wort may help some types of depression and, it can also limit or increase the effectiveness of many prescription medicines. I don’t use this herb as a drug because of the potential for interaction with prescription medication. An herb, borage is a sun-loving annual that reseeds from one year to the next. 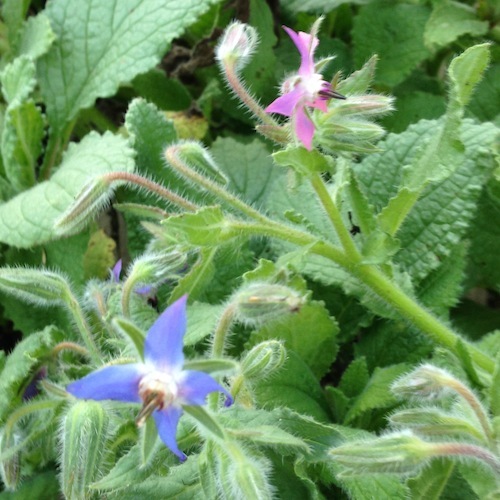 Once it is established, borage may be returning to your garden every spring. Even though it is an annual, it freely reseeds. Each plant has dozens of blooms continuously all summer and until frost. In my garden, it tends to sprawl and reaches a foot or two in height. 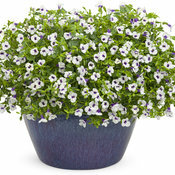 I love the periwinkle-blue blooms, a few of the flowers are pink, lavender and, rarely white. 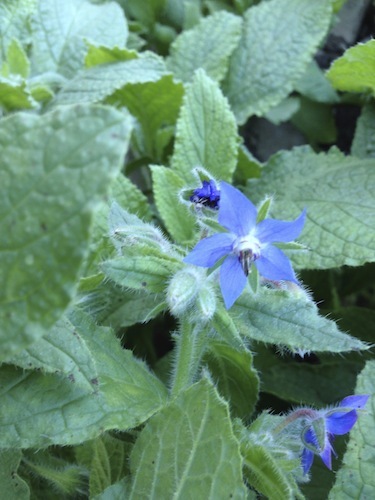 Borage flowers are Becky’s flowers today, each plant is a bouquet of colored blooms. The blooms are edible. Sometimes flowers are served on tea sandwiches, the taste is a mild hint of cucumber flavor. They can garnish a salad or cold soup. Candied borage flowers will decorate cakes or cookies and maybe cup of sorbet. In the garden, borage grows well in containers, bed and borders. It is a blooming delight, a little taller than many herbs, it is a good choice growing in the back of the herb bed. 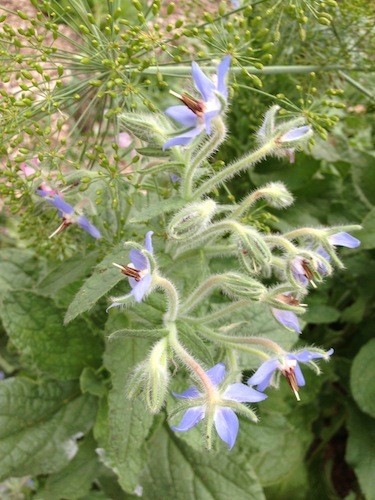 It is believed to have originated in Syria, but borage has naturalized throughout most of Europe and the USA. Because it reseeds easily, you often find it near abandoned farm homes and junk heaps. Bees love borage, it may increase the amount of honey produced in the nearby hives. Leaves can be added to green salads. Add sprigs to wine, cider or tea. Borage is a good companion plant for strawberries. Becky, these flowers are just for you. I don’t think anyone else has them in the entire State of Kansas. These are flourishing on the patio in a raised bed. I wrote about these sweet flowers on my hub pages. Catalina® Grape-O-Licious Wishbone Flower (Torenia hybrid). This annual came in a box full of trial plants from Proven Winners in the spring. Everything else went into containers and hanging baskets. But Grape-O-Licous requires part shade. On the patio, it has full afternoon shade. Our rainy spring saved it from total neglect on my part. It blooms continuosly and has spread into a rich green plant nearly a foot across. It makes a delightful ground cover, blooming non stop until first frost. This Torenia hybrid is offered in three color choices: Gilded Grape, Midnight Blue and, Grape-O-Licious. The one pictured here is Catalina® Grape-O-Licious (white with deep purple throat). 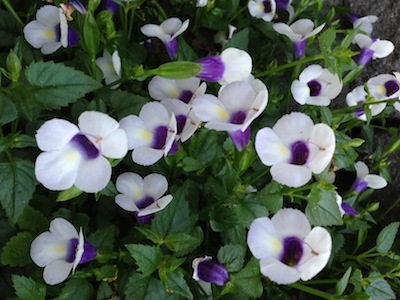 To learn more about Catalina® Grape-O-Licious Wishbone Flower (Torenia hybrid) just click. To learn more of Proven Winners just click here. Posted in Becky's Flowers, My Gardens, Oh Grow Up!